Writing at Carfree Chicago, Lake Claremont Press announces that it's entertaining proposals from anyone who'd like to write a guide to living car-free in Chicago. 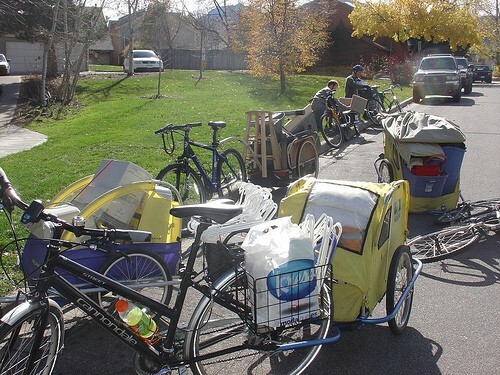 Possible topics include "lifestyle nuts and bolts and bonuses, societal/environmental/cost/health rewards for a carfree choice, the transportation gamut (public, car sharing, taxis, walking, cycling), and maybe even the far-out, just for fun (blading, scooters, canoe, boat taxis)." And don't forget the need to lobby for a transit system that runs often enough, and fast enough, and far enough, to be a decent alternative. Hmmm... maybe you should skip the book and apply for Frank Kruesi's job instead. 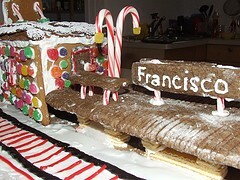 For seasonally appropriate inspiration, please click on the adorable gingerbread replica of the el's Francisco station, from Wendy Mc (more at her flickr photostream) via broan33 at LiveJournal. Gives new meaning to "Brown Line," doncha think?